What is cookie butter you ask? It's a sweet spread made from crumbled cookies that are pulverized then blended with butter, sweetened condensed milk and evaporated milk and water. If you can't find it at the grocery store, you can make your own found in the recipe below. In a large mixing bowl, whisk together the flour, salt, baking soda, and baking powder. Set aside. 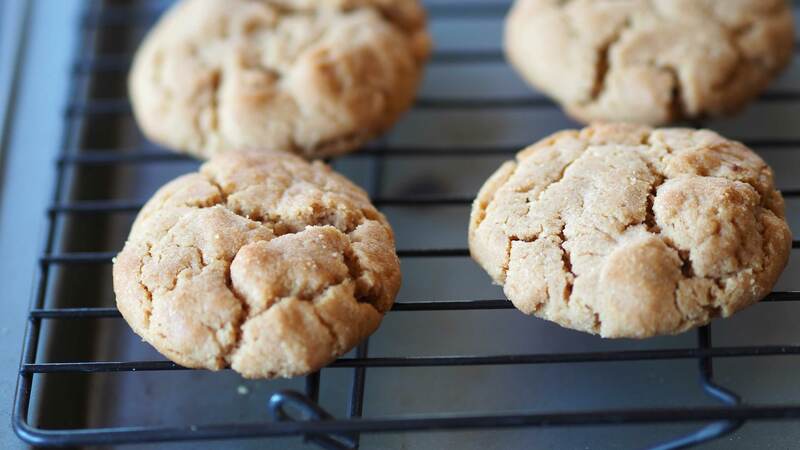 In the bowl of a stand mixer fitted with the paddle attachment, cream together the peanut butter, cookie butter, butter, brown sugar and granulated sugar, on high, for 1 to 2 minutes or until well combined. Incorporate the eggs, one at a time, then vanilla extract and mix well. Slowly add the flour mixture, on low speed, and continue mixing until just combined. Scrape down the sides of the bowl as needed. Cover with plastic wrap and refrigerate the dough for 3 hours or up to 2 days. Bake, one prepared sheet at a time, in the oven for 11 to 12 minutes or until the edges of the cookies are lightly golden brown; the top will not look done, but will set during cooling. Remove from the oven and cool on the baking sheet for 5 minutes, then transfer the cookies to a wire rack to finish cooling. Grind the coarsely broken cookies in a food processor until finely processed. Add the butter and process until blended. Add sweetened condensed milk and evaporated milk and process until blended. Add a bit of water as desired to reach the desired consistency. Cookie butter can be used in recipes or as a spread on toast, English muffins, pancakes, waffles. Use it as a dip for pretzels or fruit.